To become the master brewer he is today, Mbaku studied biochemistry during his undergrad at the University of Buea, Cameroon and received a Master’s of Engineering in Agro-Industrial Food Processing from the National School of Agro-Industrial Sciences at the University of Ngaoundere, Cameroon. During his studies he learned the nuances of brewing among many other trades, including meat and milk processing, oil production, grain cultivation and more. His well-crafted knowledge of the industry is attributable to a holistic education, where he learned much more about quality management, unit operations and innovations spanning both the food and chemical industries. After his masters degree, Mbaku joined Diageo, Guinness Cameroun SA as the Innovative and Brand Change Manager where he focused on recipe development, brewery production and innovation as a business—all the while improving upon his knowledge of the brewing process. His happiest moments at District are seeing the packaged products leave the brewery to go to market. 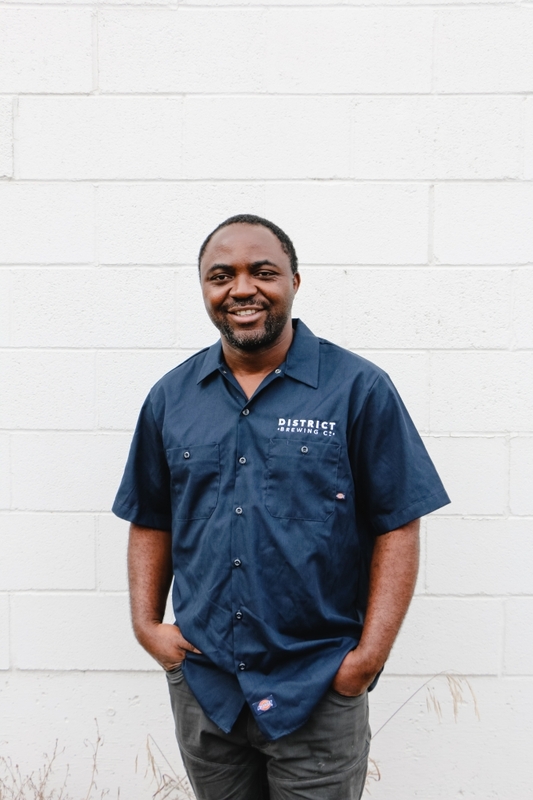 While he’s resides as head brewer at District, Mbaku’s goal is to make beer enjoyed by everyone. In his free time you can spot him reading, surfing, and playing with his youngin’.